To create a sense of place. To work with mental health practitioners to create spaces that afford both independent and facilitated engagement by their clients. To design environments which support relationships - with our self, other people and the natural world. - Creating spaces within the garden where the client and the psychotherapist can do their work. - Using plants and the season cycles of nature as metaphors for personal transformation. 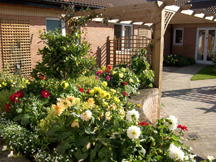 - Creating garden spaces conducive to creative arts therapies such as painting and drawing. - Creating enabling environments in which the location and uses of spaces are overlapped. - Creating Edge Spaces that integrate indoors and outdoors. - Creating landscapes that support participation by residents in routine domestic activities. - Integrating structure and landscape for planting, growing and harvesting. - Designing spaces for personal reflection, contemplation and solitude (secret garden). - Designing spaces for social interaction and community involvement (cafe or garden centre).